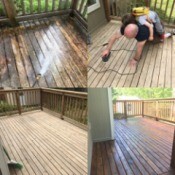 Refinishing a DeckOur deck was built 11 years ago and was in desperate need of refinishing. It was covered in mold and mildew, which made it unsightly and very slippery in our rainy weather. 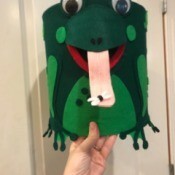 We enlisted the help of our kids and were able to get it done fairly quickly. Now have a beautiful deck again! 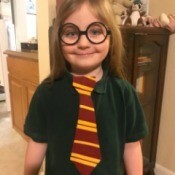 Felt Clip-on Harry Potter TiesI made these clip-on felt ties for my son's Harry Potter themed birthday. Each gift bag also included a pair of Harry Potter glasses. The kids absolutely loved them! 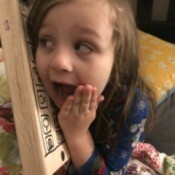 Wooden Toy CellphoneOur kids are inundated with electronic toys these days and it is so important to encourage imaginative play. My husband recently had some pieces of leftover wood from a project. He cut them into varies sizes and sanded them so our son could play with them. Yarn Ball Spider Egg SacsI have a bowl full of decorative balls on my TV table throughout the year. I decided that this year I wanted to put seasonal items in the bowl. 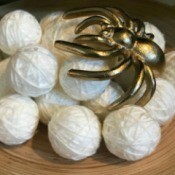 I found this awesome gold spider and instantly knew what to make for my bowl! 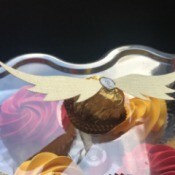 Ferrero Rocher Golden Snitch (Harry Potter)My son had a Harry Potter themed birthday party. One of the treats I made were these Ferrero Rocher Golden Snitches. They were the perfect pairing to go with the red and gold Gryffindor cupcakes that we had.